If you are able to get along to the Williamson Art Gallery in Birkenhead, you will be able to catch the annual Open Art & Photography Exhibition 2018. It’s a strong showing all round and I’m very pleased to be amongst the exhibitors this year with two pieces. 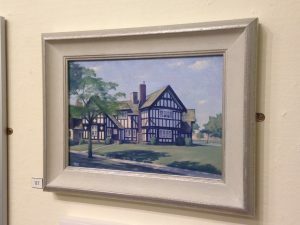 This entry was posted in Exhibitions, Port Sunlight and tagged Williamson Art Gallery, Wirral on March 27, 2018 by Stuart_d_Irwin82. 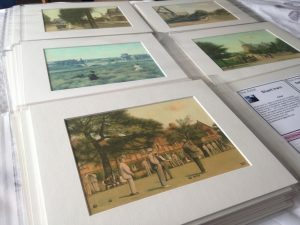 A selection of my historic Port Sunlight scenes are now available as limited edition prints. This is quite possibly a one off print run so limited indeed. There are five scenes available and they are available to view over at the ‘Prints & Postcards’ page. They measure 20 x 25 cm and each one will come individually hand signed and numbered. As the original paintings are now all sold this is a chance to grab the next best thing. This entry was posted in Uncategorized on January 3, 2018 by Stuart_d_Irwin82. 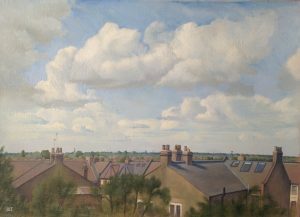 Very pleased to write that I will be exhibiting ‘Study from the back bedroom window, Wood Green’ at this year’s Royal Society of British Artists Annual Exhibition (the society’s 300th annual show) which runs from 22nd March to 1st April, 10am to 5pm at the Mall Galleries in central London. 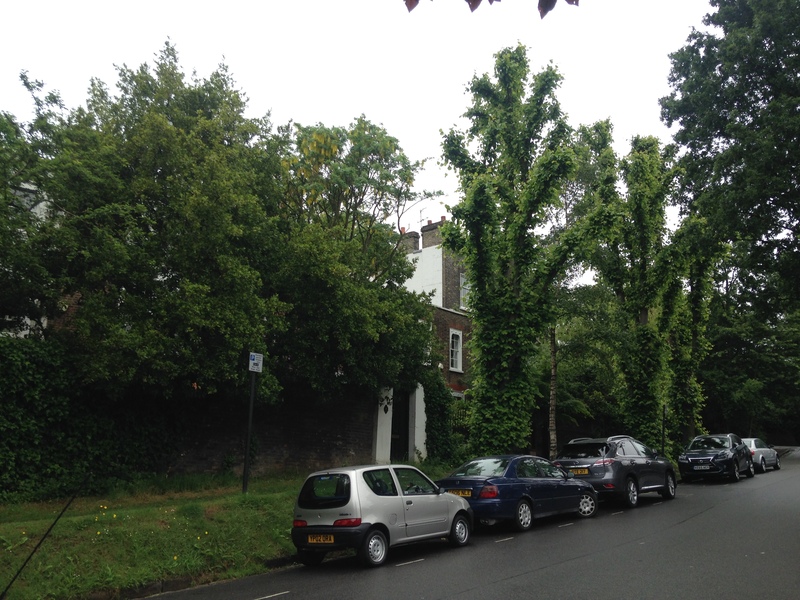 The painting was executed from Palace Gates Road in North London, and looks North East across Bounds Green during summer 2016. Very much looking forward to seeing the show now! my first London exhibition. Stuart. This entry was posted in Exhibitions and tagged 2017, Art, Exhibtion, London, Mall Galleries, Royal Society of British Artists on January 25, 2017 by Stuart_d_Irwin82. I loved painting the fields of Irby. They are old fields, and I have a deep attachment to them. They have names like Meckansedge and Old Smores. They are the space between my home village of Greasby, and the village where my grandmother lived in a road called Heathbank Avenue, on the edge of the heath. One of my earliest memories is jumping off the Crosville bus on Mill Lane and breaking from my mother, I ran into the wheat with a boy from the playgroup called Mathew Whitham… it was 1986. These were the same fields in which I cut my teeth as a painter. These are the fields that lie on the edge of suburban Irby, to the north of the current centre of the village. They sit between two ancient highways and are spilt down the middle by Mill Lane – Sandy Lane is to the west and Limbo Lane to the east. Limbo Lane is supposed to be part of the Roman road linking Chester with the then sea port at Meols. Sandy Lane is even older, linking the farming communities of Thurstaston with Greasby. It was here in the 1980s that a series of suburban gardens to the west of Mill Lane became the focus of a study which revealed them to be an archaeological site with a long history of human settlement. In the early 1980s curators at Liverpool Museum were shown a near complete Roman pot which had been discovered in said garden during a ‘Dig for Victory’ campaign during the second world war and been kept in a powdered milk tin for the past 40 years. Whilst I was hoping on and off of buses and gleefully running through the summer wheat on one side of the road, on the other side a site was dug out by archaeologists from National Galleries & Museums on Merseyside and between 1987 and 1996 they found evidence of a long sequence of occupation from Mesolithic, Bronze Age, Iron Age, Romano-British, early medieval and later medieval periods. Irby had previously produced evidence of Romano-British activity after broaches and coins had been found in the area and in neighbouring villages. More Roman shards had been discovered in the same field to the north of the excavated site in November 1988 and a group of about 10 4th-century Roman coins were found buried together in the field boundary sometime later. This is to the west of the site in the same field, known as Smoores. Sandy Lane, the old road from Thurstaston to Greasby sits behind the trees here. This was a glorious day, 23rd July 2010. I painted two oil sketches, this being the second, before retiring to the Irby Mill pub for a well-earned pint. No Irby Mill in those days, but the site lies near the top of one of several sandstone ridges that cut along the Wirral Peninsular and on the slopes of the ridge the soil drains well and would have been easy to cultivate as well as to erect building structures in. The chance to exploit the local sandstone and other minerals would also have been a factor in the choice of location and may be one reason for the longevity of the occupation. Most of these paintings were done on a piece of the heath that sits alongside Limbo Lane to the east of the site. The field seemed to have been neglected and being uncultivated had a peace about it. The light was fantastic and it was a wide expanse in which to catch some great skyscapes and sunsets. It this quiet corner of Wirral the presence of the past is strong and I always try to lock into that ‘haven’t we been here before’ feeling and attempt to bridge the divide with those people lost in the mists of time that farmed the earth and made this land their home millennia ago. Along with my personal affection for the area, these paintings were in some small way an effort to convey a sense of peace and continuity in these unassuming but as it turns out, very important group of fields. This entry was posted in Uncategorized and tagged Art, Irby, Merseyside, Painting, Roman, Wirral, Wirral History on November 8, 2016 by Stuart_d_Irwin82. 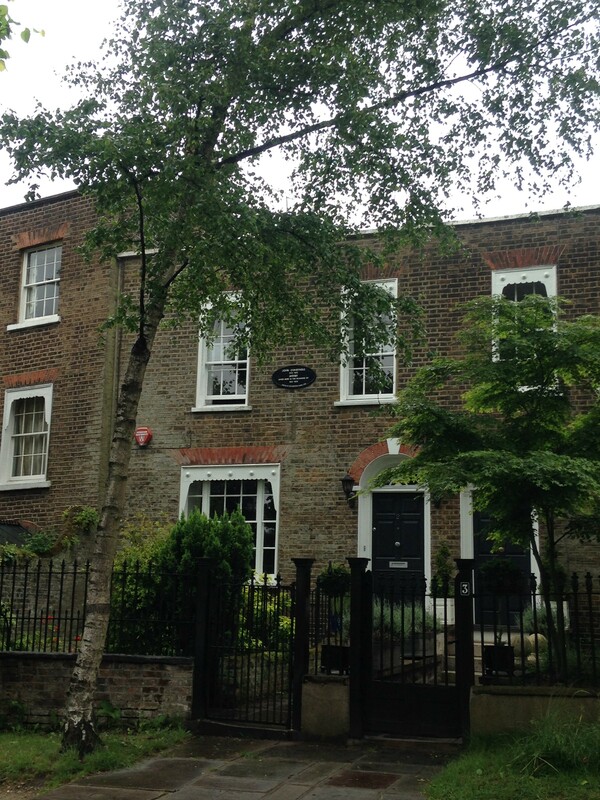 Having spent many years pouring over John Contable’s work, in particular his Hampstead era landscapes and oil sketches – some of which I consider to be his finest works – last weekend I took the opportunity to explore his old stomping ground in North London. 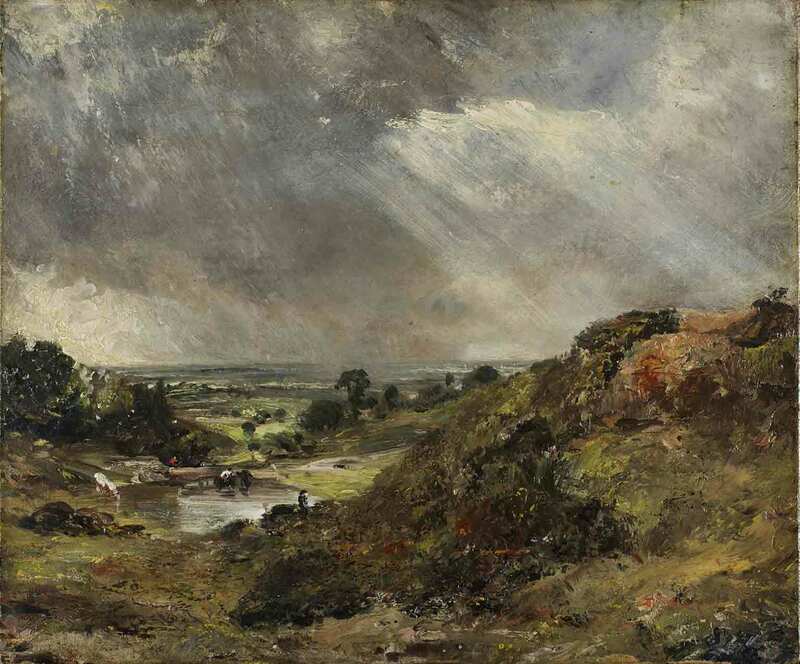 Despite the fact that Constable will forever be associated with Suffolk, that area of the county now labelled ‘Constable Country’, the artist spent a large proportion of his professional years based in London. Like most professional artists of his time, Constable needed a base in London to negotiate with prospective buyers. 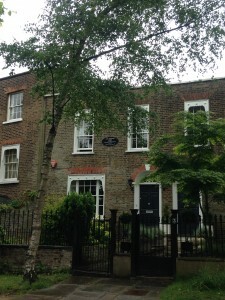 After his marriage in 1816, he established a home at 76 Charlotte Street, Bloomsbury (now demolished), and then every summer from 1819 to 1826 rented a house at Hampstead for his family. During these periods he would let out part of the Charlotte Street property and would later remark that he was ‘three miles’ door to door – can have a message in an hour – and can always get away from idle callers – and above all see nature and unite town and country life’. Hampstead Village was at that time part of Middlesex, outside the city. Constable originally arranged these summer migrations to improve the health of his wife and children, but he soon found plenty of subjects to paint. The family moved there more permanently in 1827. 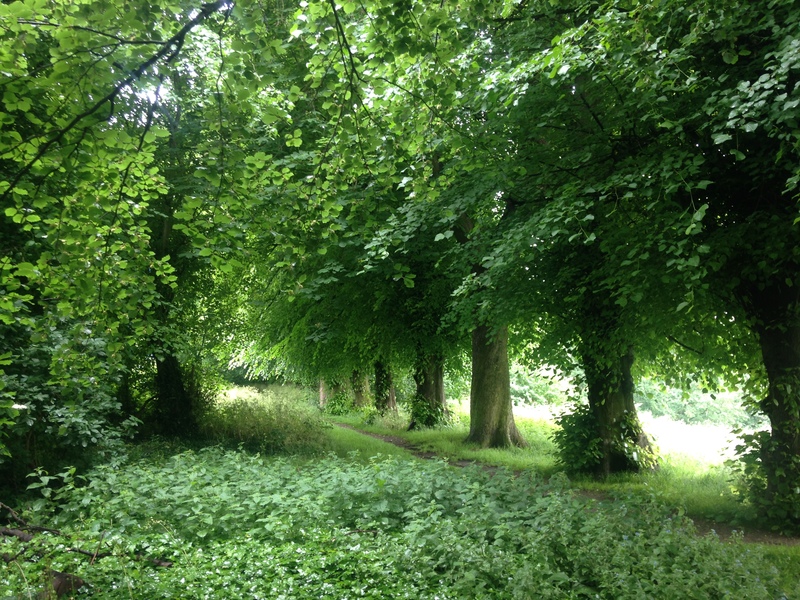 This first blog post deals with the area the west of the village centre, and West Heath. Lower Terrace Number 2 Lower Terrace is the house the family stayed at in the summers of 1821 and 1822. The road is close to the centre of the village, and overlooks West Heath. ‘Lower Terrace, Hampstead’ c. 1821 -2. Board of Trustees of the Victoria & Albert Museum. I remember this painting appeared in one of the first Constable books I owned, ‘The Essential Constable’, which included a broad mix of works not always featured it more serious study’s of the artist – some of which had dubious attribution as I recall – but it also included some of the paintings that I would grow to love. Note that the left hand edge of the painting is unfinished, and has been folded back at some point. Two views of Lower Terrace as it appears today. ‘The last day of Octr was lovely so much so that I could not paint for looking – my wife was walking with me all the middle of the day on the beautiful heath. I made two evening effects’. 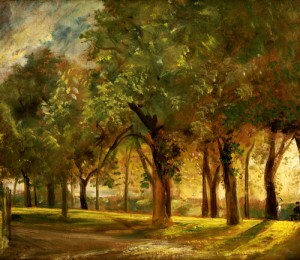 Judge’s Walk, Hampstead, Oil on Paper Laid on Canvas, 1821. 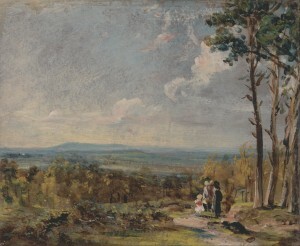 Hampstead Heath, Looking towards Harrow 1821. Oil on paper laid on Canvas. Yale Center for British Art, Paul Mellon Collection. Branch Hill Pond Judges Walk looks out over Branch Hill Pond, which featured in many of Constable’s standard Hampstead compositions as well as oil sketches. Branch Hill Pond, Hampstead, 1819. Board of Trustees of the Victoria & Albert Museum. This is his first known dated oil of a Hampstead subject, painted on canvas at the end of October 1819. Constable would go on to repeat variations of this view until 1836 (‘Hampstead Heath with a Rainbow’ in the Tate collection). This painting includes some brilliant impasto work dispatched with the palette knife. Difficult to obtain the exact view, and probably taken from a slightly different angle to the right, but this shows the hollow where Branch Hill Pond once sat, looking west towards Harrow. 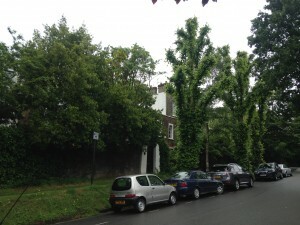 The house to the left through the trees, The Chestnuts, on Branch Hill was once lived in by the American singer and actor Paul Robeson during the late 1920s. 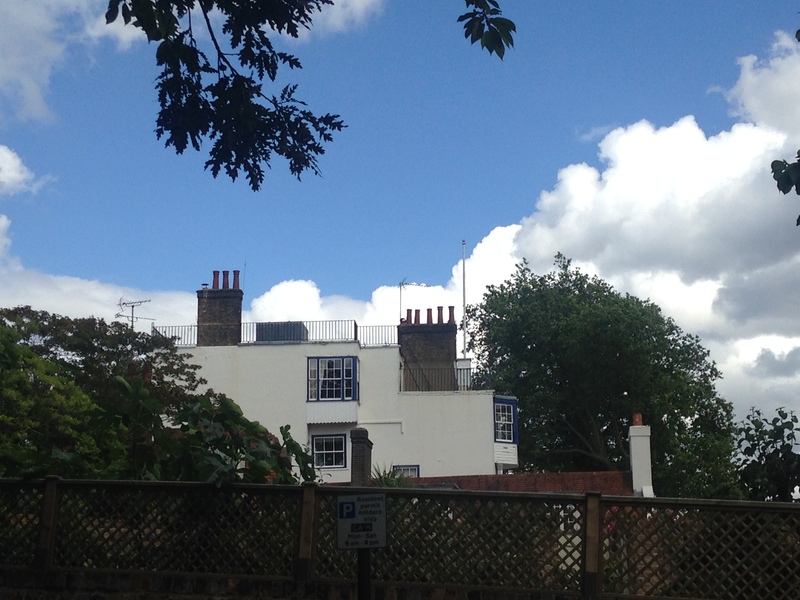 The Grove With a flat roof resembling the quarter deck of a man-of-war, the house called ‘The Grove’ was occupied in the early nineteenth century by a former lieutenant of the navy, Fountain North. North had had the house altered, and is said to have fired cannon on special occasions. 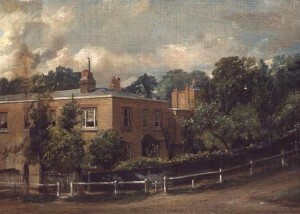 ‘A Romantic House at Hampstead’ (The Grove), 1832. National Gallery Berlin. Constable made several views of this property from different angles. 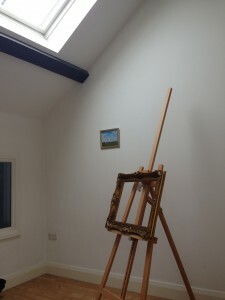 The painting here shows the house as seen from Lower Terrace, almost across the road from number 2. The house is little altered and the same view can be obtained today. It is sometimes referred to as ‘Admiral’s House’ having been renamed that in 1917, in the mistaken belief that Admiral Mathew Barton had lived there. 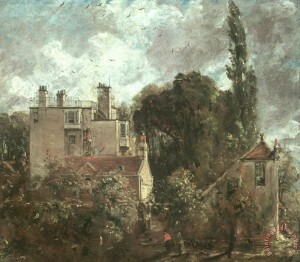 The painting was known as the ‘Romantic House’ amongst Constable’s children. ‘The Grove’, as seen from Lower Terrace today. 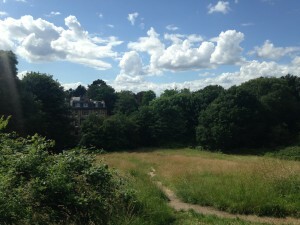 This entry was posted in Uncategorized and tagged Art, British, Hampstead, Heath, John Constable, Landscape, Painting on July 12, 2016 by Stuart_d_Irwin82. Very pleased to announce that my first solo exhibition will take place at Domby Gallery in Southport between 14th May and 25th June. The exhibition will feature a selection of my Wirral landscapes along with river scenes painted on both banks of the Mersey. 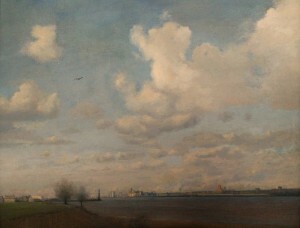 The Mersey from Shorefields, New Ferry. Oil on Canvas. The special preview and drinks will take place at the gallery between 6pm – 8pm on Saturday 14th May. Please see the Domby Gallery website for further details. This entry was posted in Uncategorized and tagged Art, Domby Gallery, Exhibition, Gallery, Liverpool, Southport on April 16, 2016 by Stuart_d_Irwin82. It has been a great start to the New Year as I’m embarking on a new commission to create a piece of Wirral history. 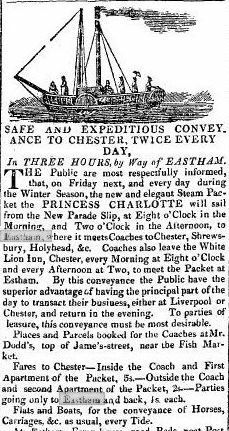 Newspaper clipping advertising the Ferry between Liverpool and Eastham, 1816. 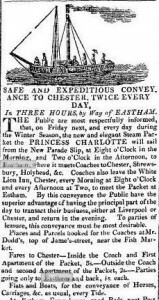 This year is the bicentenary of the first steamer that ran on the River Mersey between Liverpool and Eastham on Wirral, The Princess Charlotte. Sketches and lithographs of the boat featured in 19th Century newspapers and literature but it has never been properly depicted in colour before. 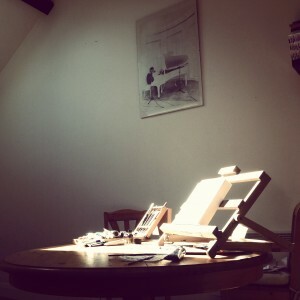 To create the painting I’ll be working off these old prints, along with sketches I made at Eastham in 2012 / 13. Having spent many hours absorbing the landscape and river, I’m really excited by the prospect of depicting a stretch of the Mersey coastline I really love! This entry was posted in Uncategorized and tagged Eastham, Heritage, Liverpool, Mersey Ferry, River Mersey, Wirral, Wirral History on February 11, 2016 by Stuart_d_Irwin82. Throughout August and early September I will be in residence and have work available for sale at Bridge Cottage in Port Sunlight. 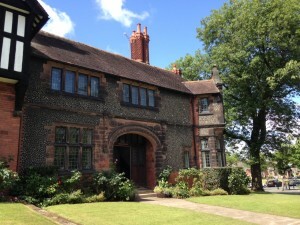 The cottage has been opened as part of a pilot project run by Port Sunlight Museum, and will be open at selected times throughout the week, with free entry. This entry was posted in Uncategorized and tagged Art, Bridge Cottage, Port Sunlight, William Lever, Wirral on August 4, 2015 by Stuart_d_Irwin82. This entry was posted in Uncategorized on June 10, 2015 by Stuart_d_Irwin82. 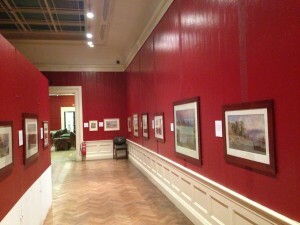 The Williamson Art Gallery in Birkenhead are displaying their rather lovely collection of 19th Century watercolours at the moment. Two of my highlights were Turners Gulf of Naples (‘Vesuvius angry’) and Constables Layer Marney Towers, Essex which is a slight, shadowy thing. I like the Williamson because it has a interesting and rich landscape collection and it does these low key exhibitions well. This entry was posted in Exhibitions and tagged Constable, Exhibition, Gainsborough, Turner, Watercolour, Williamson Art Gallery on February 22, 2015 by Stuart_d_Irwin82.